Are the Yankees in a “Rebuilding” Mode? With C.J. Wilson in Anaheim and Yu Darvish reportedly headed north of the border or deep in the heart of Texas, the Yankees’ offseason pursuit of pitching has so far come up short. Unlike last year, however, when the team’s courtship of Cliff Lee was rebuffed, it doesn’t seem as if the Yankees had much interest in Wilson or Darvish, not to mention the many starters rumored to be available on the trade market. For some Yankees’ fans, this level of inactivity has been the cause of great frustration, leading to speculation that the team’s free spending ways may be a thing of the past. 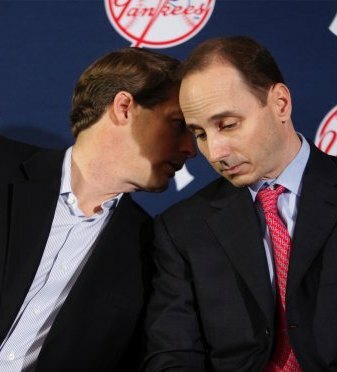 Hal Steinbrenner and Brian Cashman appear to be on the same page about being more prudent in player acquisitions. Hal Steinbrenner’s unwillingness to open up the checkbook and Brian Cashman’s reticence to part with prospects seem to contradict the team’s “win the World Series or bust” mantra. After all, it’s hard to argue that Darvish, Wilson, Gio Gonzalez, etc. wouldn’t represent a major upgrade in the Yankees rotation, which, after CC Sabathia, consists of major question marks. Even though rolling the dice with such a rotation worked out well last year (assuming, like me, you consider a 97 win season to be a success), doing so again would constitute a major risk, especially in a league getting stronger by the minute. The Yankees’ mandate is to win the World Series, but that isn’t a short-term proposition. Although fans, and some within the organization, rarely think too far ahead, it’s important to remember the team’s real mission statement is to win the World Series every year (or at least try), not just this year. That’s why Cashman’s cautious approach isn’t a betrayal of the team’s lofty standards. As the Yankees’ GM has repeatedly stated, no deal is better than a bad deal, which basically means the long-term competitiveness of the franchise is more important than an incremental, short-term gain. Last year, the Yankees took a low-risk gamble on Freddy Garcia that paid off handsomely, so this year, they’ve decided to roll the dice again. Freddy Garcia will be returning to the Yankees’ rotation, but whom will he be joining? Before the 2011 season, Garcia wasn’t a lock to make the team, much less the rotation, but the veteran right hander wound becoming a key cog, going 12-8 with a 3.62 ERA in nearly 150 innings. On any team, that kind of production from a fifth starter would be exemplary, so it’s not hard to see why the Yankees would want to bring Garcia back on a one-year deal worth a reported $5 million. The only problem is Garcia currently ranks much higher on the Yankees’ rotation totem pole. You could make the case Garcia was the Yankees’ second best starter in 2011, so, it’s not too farfetched to think he might be the same in 2012. C.C. Sabathia remains the rotation ace, but after the big lefty, not much else is certain. A.J. Burnett has been so bad for two straight seasons that any positive projection has to be considered blind optimism. Also, although the Yankees may be quietly confident about Phil Hughes having a bounce back year, his struggles over the last season and a half are hard to ignore. Finally, Ivan Nova’s breakout 2011 campaign seems to bode well for the future, but the 2010 performance of Hughes is a reminder about how inconsistent young pitchers with little big league experience can be. In other words, the 2012 Yankees’ rotation is full of question marks, and the return of Garcia doesn’t really provide any definitive answers. Pitching, pitching, and more pitching. That has become Brian Cashman’s mantra when addressing questions about his offseason plans. But should that be his only focus? Last year, the Yankees offense was very strong in terms of run production. In fact, it was historic when compared to the league average. However, a couple of warning signs are evident (albeit relatively minor) when you take a look under the hood. 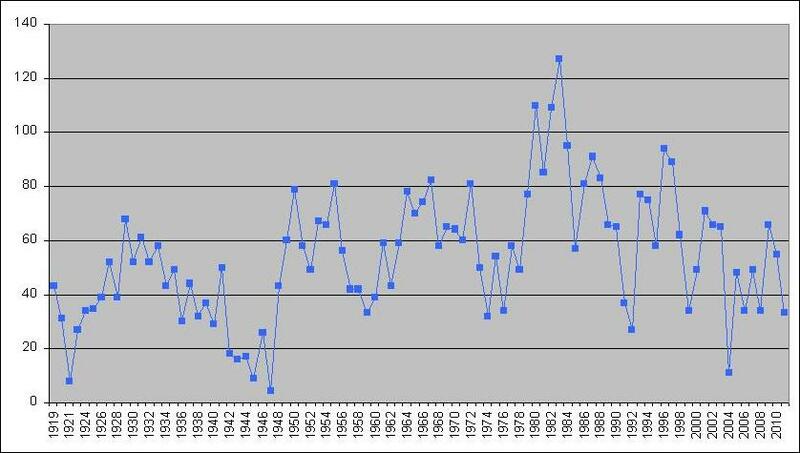 As illustrated in the chart below, at the same time the Yankees’ average run total per game spiked, the underlying performance of the offense, as measured by OPS+, dropped to its second lowest level since 2001. Also, although the lineup’s 2011 wRC+ of 113 was healthier than last year’s, it was still off recent highs in 2007 and 2009. 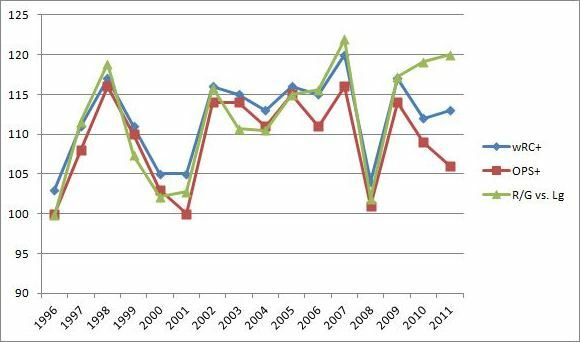 Until 2010, the Yankees’ relative run production had an almost perfect correlation to weighted Runs Created and adjusted OPS (r2 of .97 and .93, respectively), so unless the divergence experienced over the past two years is sustainable because of an underlying dynamic (improved base running and lots of homeruns? ), Cashman should at least be mindful about the possibility of these lines converging in 2012. Note: R/G vs. Lg is the Yankees’ R/G divided by the league average. As the baseball Hot Stove slowly builds from early embers, the Captain’s Blog will be busy identifying the top pitching targets that the Yankees should consider pursuing in a trade. In part one, a game plan to acquire Felix Hernandez was devised. Admittedly, such an acquisition probably falls under the heading of wishful thinking, so just in case that advice proves unsuccessful, one of two backup plans is now suggested (for a link to the other, click here). Assuming the Mariners refuse to trade Felix Hernandez at any price, and the cost proves too prohibitive for the likes of Gio Gonzalez and John Danks, there are still several attractive options to consider. In particular, a trio of talented young right handers could all be made available by their respective teams, and Brian Cashman should be first line to kick the tires on each one. As the baseball Hot Stove slowly builds from early embers, the Captain’s Blog will be busy identifying the top pitching targets the Yankees should consider pursuing in a trade. In part one, a game plan to acquire Felix Hernandez was devised. Admittedly, such an acquisition probably falls more under the heading of wishful thinking than a wish list, so just in case that advice proves unsuccessful, one of two backup plans is now presented. Because of the short porch at Yankee Stadium, left handed pitching has always been a coveted commodity in the Bronx. 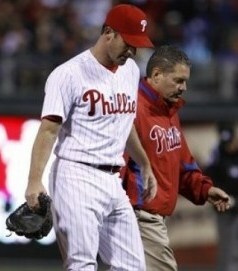 That’s why last year’s blueprint revolved around the acquisition of Cliff Lee and return of Andy Pettitte. However, when both lefties decided against pitching in pinstripes, it left the Yankees with CC Sabathia as the team’s lone southpaw. 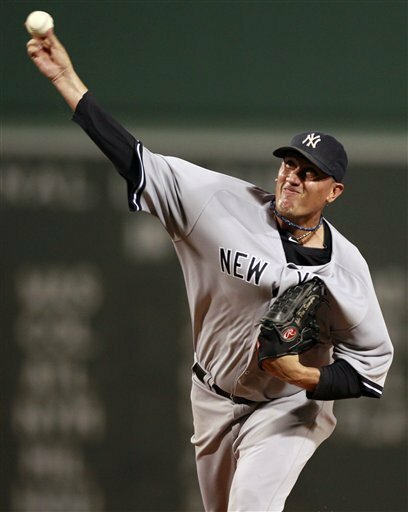 As a result, the Yankees ended the 2011 season with only 33 starts by a left hander, one of the lowest totals in franchise history. Three of the most prominent free agent pitchers (C.J. Wilson, Yu Darvish, and Mark Buehrle) are left handed, so if the Yankees decide to enter the market, they should be able to find a complement for Sabathia. In addition, several lefties may also be available on the trade market. Two of the more attractive options are presented below.